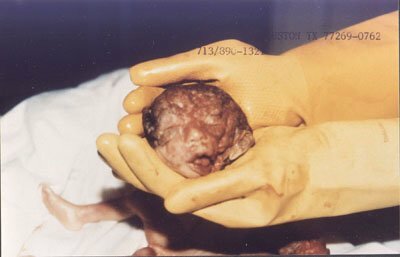 This 25-week-old "fetus" was aborted in December of 1989 at the Women's Pavilion, a Houston, Texas, abortion clinic - one in a chain owned by Dr. Douglas Karpen. 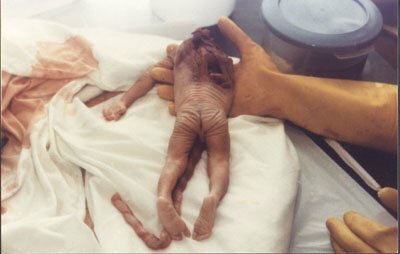 The 15-inch preborn underwent a D&E abortion, where limbs are removed one by one. 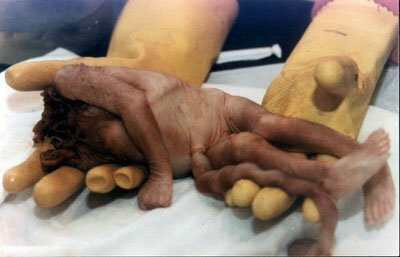 The head and arm of this baby were ripped off the body. On Friday evening, December 15, 1989, in Houston, Texas, Chad Traywick and his wife Darda returned home to find themselves surrounded by swarms of police - including the SWAT team and a van from the coroner's office. After police pulled the shocked couple from their truck and patted them down, Detective John Hill told Traywick the police wanted to search his house. Hill exlained: The local photo finishing store had called police headquarters to report that Traywick had apparently beheaded and mutilated a newborn baby and had taken pictures of the infant. The SWAT team had come out in force, prepared to arrest Satanic cult members - baby killers who had the audacity to photograph their victims. The officers expected to find occult paraphernalia associated with child sacrifices in the house - something they encounter all too often. But when police entered the house, they discovered, not Satanic paraphernalia, but prolife and religious posters and books. Traywick told the police what really happened. Newly active in the anti-abortion movement, Traywick had gone to a local abortion clinic - the Women's Pavilion - to find the best location to conduct a picket. Finding the building deserted and the door open, he took a quick tour. After wandering through stylish, relaxing waiting areas and immaculate operating rooms, he entered a small back room filled with stacks of lidded plastic buckets. Realizing what they must contain, he snatched one of the buckets and made a fast retreat. Enlisting the aid of his wife and a friend to photograph and videotape his opening of the container, Traywick slowly lifted out the contents from the bucket. He was shocked to find, not a tiny fetus as he had expected, but what appeared to be a full-grown baby, whose head and arm had been ripped from his body and his brain removed. The little boy had an incision where other organs had apparently been removed - evidence that someone had sought more profit from the baby's death than the $1,800 the abortion had cost. Traywick drove the roll of film to the nearest one-hour photo developer. "I explained to them that the pictures were of an aborted baby and asked if they would have any problem or felt uncomfortable developing them," recalls Traywick. Over the blare of the Christmas rush, the clerk hastily took the negatives and assured Traywick there would be no problem. When he returned for the developed photos, however, the clerk was obviously uncomfortable and nervous. After convincing police he was not a baby-killer, Traywick agreed to make a statement at police headquarters the following morning. 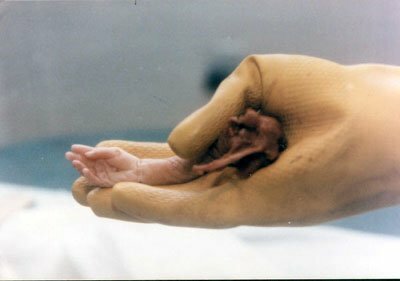 On January 20, 1990, Chad Traywick buried the aborted baby, whom he named David, after a memorial service attended by over 100 people. Since then, Baby David has become a sort of prolife poster child; his pictures have been made into posters for use at prolife "rescues" and pickets in Corpus Christi and in Houston, and have even made their way into the Corpus Christi Sheriff's Department, where Sheriff James Hickey displays them. Says Hickey, "The majority of people here are prolife in their sentiments, but they just won't come out publicly and say something about it. They're reluctant to place a lot on the line." Hickey helped form the organization "Officers for Life" - a national organization - and refuses to arrest "Operation Rescue" demonstrators who try to stop abortions by blocking access to abortion clinics.